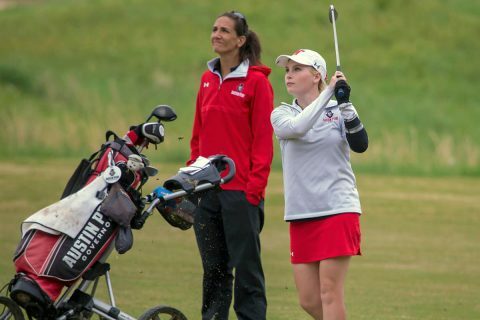 Clarksville, TN – Austin Peay State University women’s golf has an ambitious schedule, which includes a season-opening trip to the GolfWeek Program Challenge in Myrtle Beach, South Carolina and a defense of their 2017 title at the Town and Country Invitational, highlights the APSU schedule laid out by head coach Amy McCollum . The Govs open the fall slate September 9th-11th at the Golfweek event, hosted by golf’s top weekly magazine at Pawley’s Island. That will be followed by the first of two Morehead State-hosted events on the schedule at Greenbrier Country Club in Lexington, Kentucky for the MSU Greenbrier Invitational, September 17th-18th, followed by the Jacksonville State-hosted Chris Banister Golf Classic a week later in Glencoe, Alabama. The Govs return to Clarksville Country Club for the second year in a row to host the 2018 F&M Bank APSU Intercollegiate, October 1st-2nd; seniors Reagan Greene  and Taylor Goodley  both put together top-10 finishes to lead the Govs to a fourth-place finish in the event last season. Austin Peay closes the fall slate at the ULM-hosted Fred Marx Invitational, October 15th-16th, and at nearby McCabe Golf Course in Nashville, October 29th-30th. Last season, the Govs routed the field at McCabe, with rising senior Ashton Goodley  taking runner-up honors behind the now-departed AnnaMichelle Moore . The Govs will open the spring slate with a unique event in Mount Pleasant, South Carolina, site of the Oyster Shuck Match Play Challenge. Hosted by The Citadel, this unique event pits golfer in a heads-up round against an opponent, earning points for holes won or lost rather than number of strokes accrued. After a brief respite following the match play event, the Govs enter the teeth of the spring slate with three March events, first at Western Kentucky’s Spring Break Shootout in Dade City, Florida (March 11th-12th) before another Morehead State-hosted jaunt to Sorrento, Florida for the Citrus Challenge (March 17th-19th). Last season, rainy weather shortened the latter event to 36 holes, with Greene walking away as the overall runner-up finisher. The Govs close out March with a visit to Richmond, Kentucky for the Colonel Classic at the University Club at Arlington, March 29th-30th. The Govs will round out the regular season April 5th-6th at Murray State’s Jan Weaver Invitational (April 5th-6th) before returning to the Schoolmaster Course at the Robert Trent Jones Golf Trail stop in Muscle Shoals, Alabama for the 2019 Ohio Valley Conference Women’s Golf Championship, April 15th-17th. The 2019 NCAA Division I Women’s Golf Regionals will be held May 6th-8th in Auburn, Alabama; Cle Elum, Washington; East Lansing, Michigan; and Norman, Oklahoma. The 2019 NCAA Women’s Golf Championships are scheduled for May 17th-22nd in Fayetteville, Arkansas.